Carb Heaven! 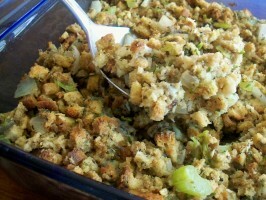 My Thanksgiving stuffing faves! Heat milk, butter, and oyster liquid in small pan. Combine bread cubes, celery, onion, spices, and oysters. (You may cut up the oysters if they are too large for you.). Stuff poultry or place in greased foil lined baking dish. Bake 350 degrees for 1 hour, or until poultry is done.